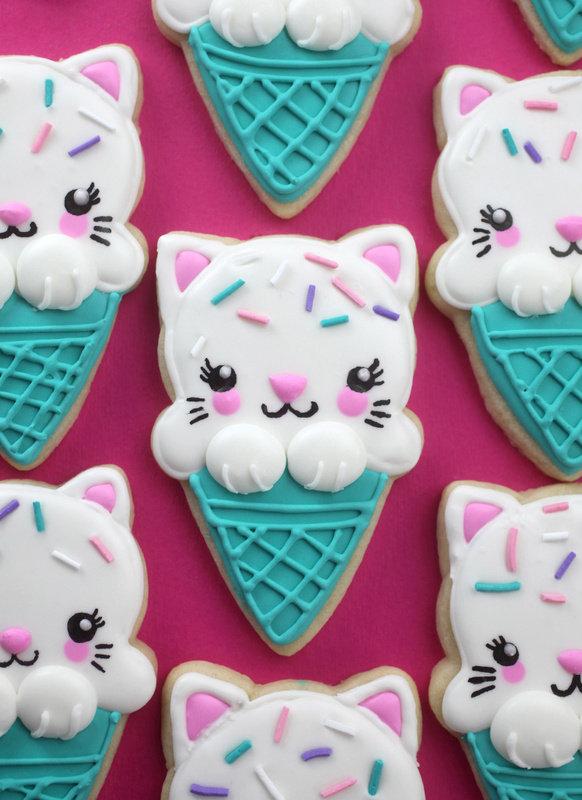 I’m super in love with these ice cream turned kitty cat cone sugar cookies. 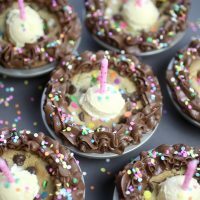 They are all kinds of adorable and pretty easy to decorate. 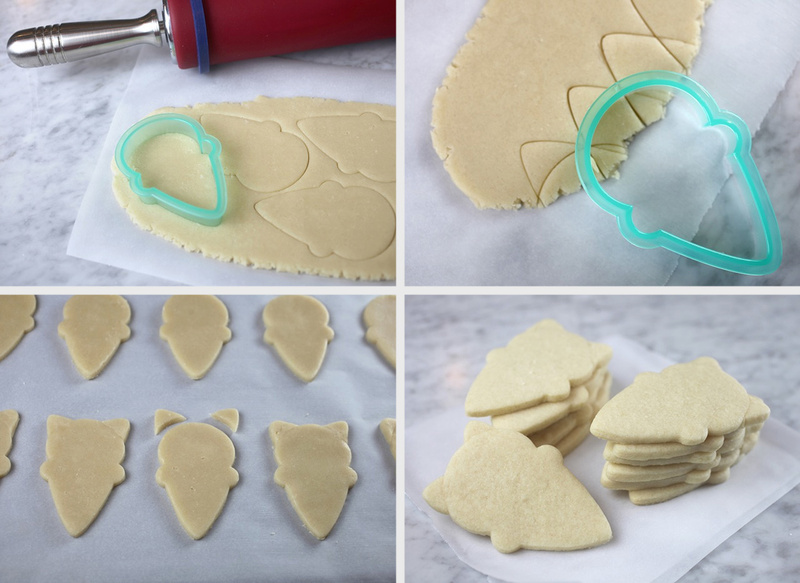 I used this ice cream cone cookie cutter from Sweet Sugarbelle’s line of awesome cookie decorating products. I love that the lines of the cone are more rounded than straight. 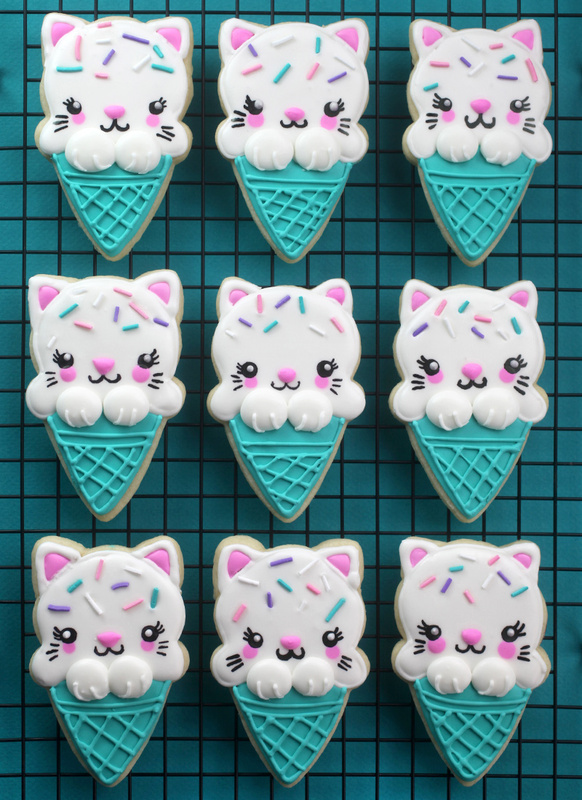 When I was deciding what kind of ice cream to make, it was the end of the cone that inspired me to turn them into kitty cats. The tip of the cone can be used to make the perfect little ear shape. 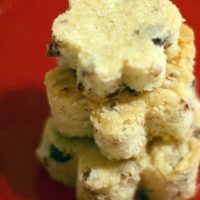 Use it to cut out rounded triangles and then use the rounded ice cream end to cut out a curved bottom like in the pics above. 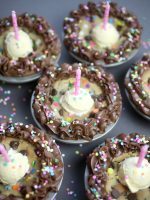 Then gently press the ears to the cut out ice cream cones and bake away. P.S. 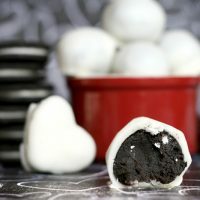 Here’s the sugar cookie and icing recipes I used to make them. 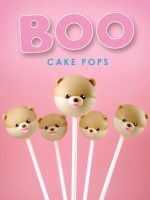 Check out some of Sweet Sugarbelle’s other products. 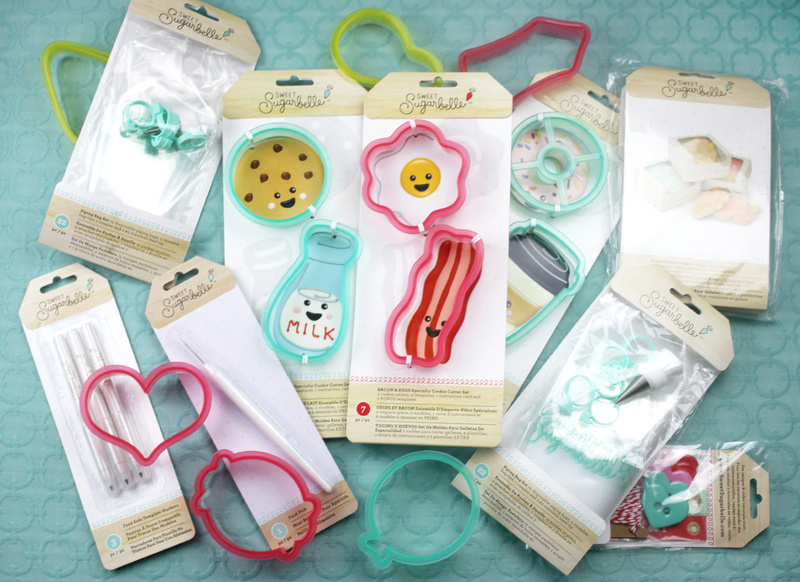 Cookie cutter duos, decorator bags and tips, cute packaging in different sizes. 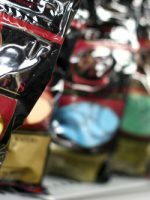 So much good stuff. 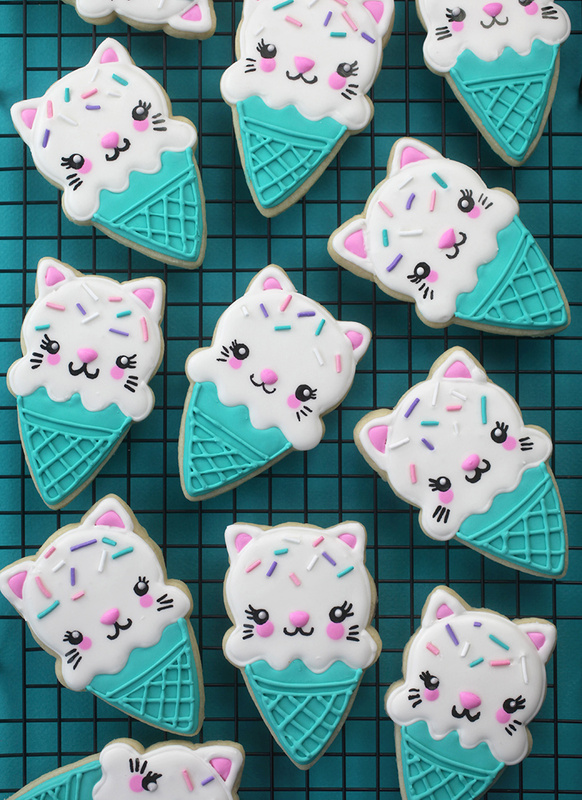 And make sure to visit Sweet Sugarbelle’s blog for endless cookie decorating ideas, too. 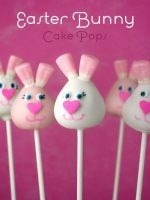 When you’re ready to decorate, pipe pink royal icing on the ears and use a scribe (more on this in a minute) to help shape them. 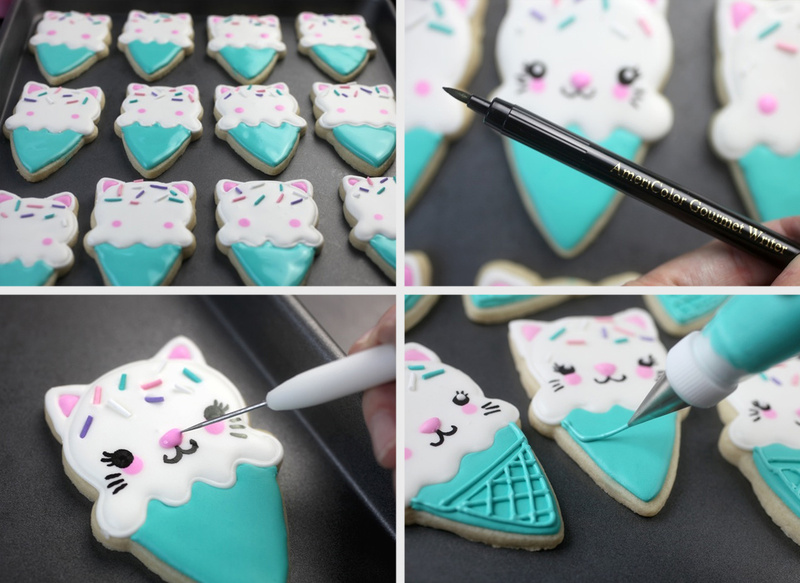 Working with one cookie at a time, pipe the outline of the ice cream and ears with white royal icing. Fill the center of the cone with flow consistency icing and immediately dot two pink cheeks in position. Then carefully place sprinkles toward the top portion of the ice cream. Next, pipe and fill the bottom of the cones. Let dry for a couple of hours so it’s safer to add facial details without messing up the icing. When dry, use a black edible ink pen to draw on faces. I like this one from Americolor. Gently draw eyes, mouths, lashes and whiskers. Don’t press down too hard just in case the icing isn’t completely dry when drawing. Then dot on pink royal icing in position for the nose and use the scribe to help shape it into a rounded triangle. 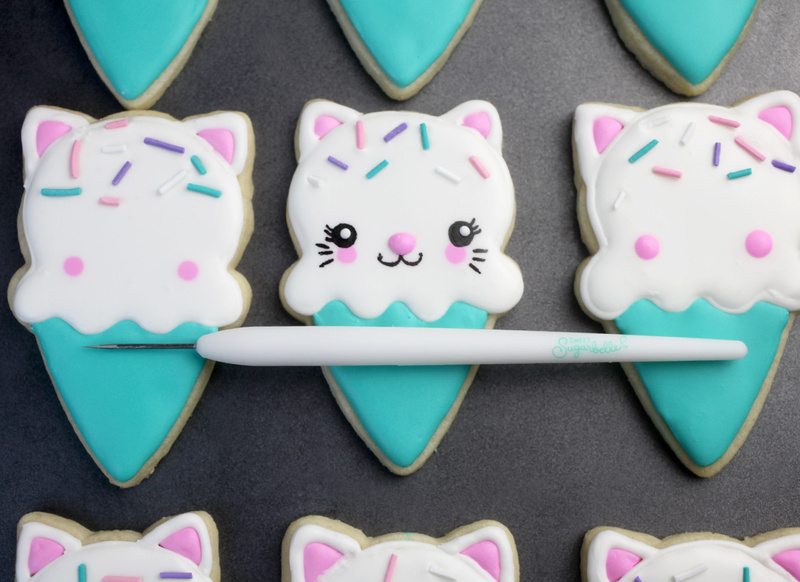 Dot the eyes with white royal icing for a little more personality. Ummm… I mean purr-sonality. Finish decorating by piping waffle cone lines and let dry completely. Rewind. The scribe/food pick tool! Okay don’t laugh but this may be my favorite tool in a long time. Probably because I have never had one to use before. I’ve just always grabbed a toothpick to help coerce royal icing if needed. Well, now I don’t want to live without one. The super thin and pointed tip is much more precise. Throw in the long handle and it’s way better than a toothpick. I guess if I were a cookie decorator I would know about these things. Sometimes it takes a while. 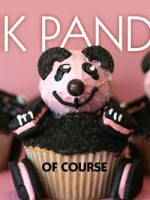 ; ) Anyway get one if you enjoy making decorated sugar cookies. But, I think the ice cream drips are begging to be turned into kitty paws. Pipe two dots over the two center drips with thicker consistency royal icing. Let dry and pipe short lines on top. Paws or no paws? What do you think? 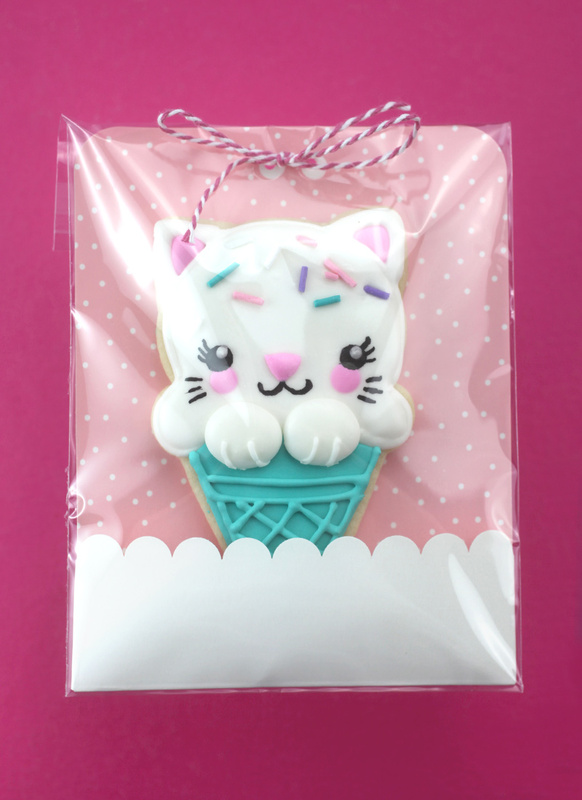 Package your pretties in the cutest treat bags, also from Sweet Sugarbelle. Purrfect to gift to someone special. Purrfectly pawesome as you say. My kids would go crazy over these. 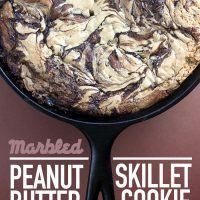 As always, well done Bakerella! Purrfectly adorable…. with paws, please! OMG so cute! You never cease to amaze me! Thank you! 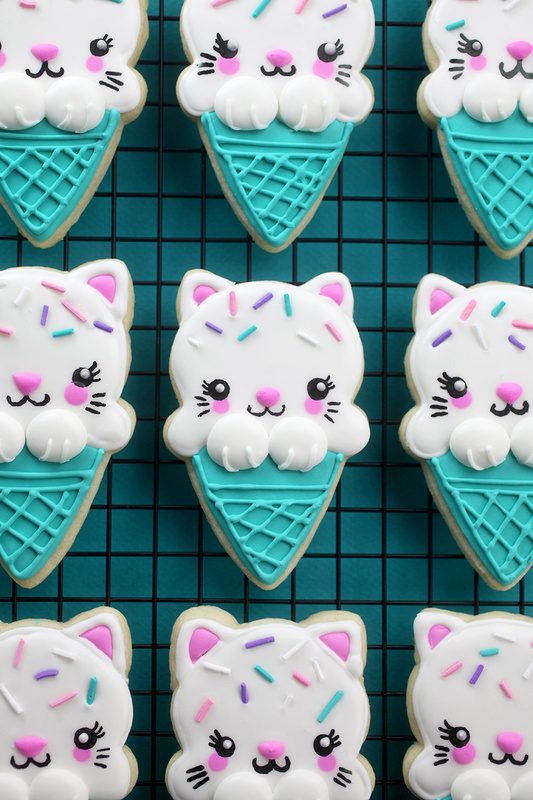 When your food crafting hero makes amazing things with your cutters…allll the hearts! 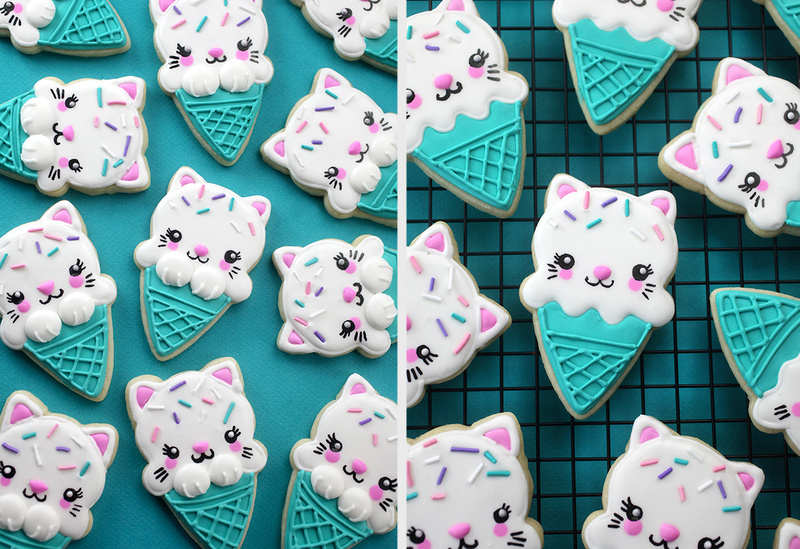 Just when I think these kitty cone cookies couldn’t get any cuter, you go and add paws! So adorable!!! This is sooo cute! such a great idea. I love it ??? thank you Angie! 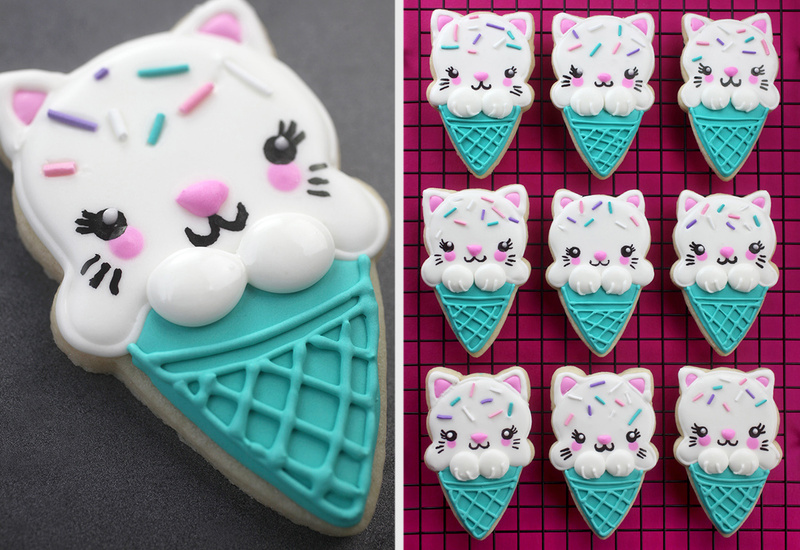 You always have the talent to turn simple yummy cookies into something that’s also delectable for the eyes! I adore the cone shape details! The kitty is cute too. Super cute! I know sweetsugarbelle would be so proud, and flattered! I love them! Esp w the paws! Super creative! You’re site is amazing. So glad I found it! 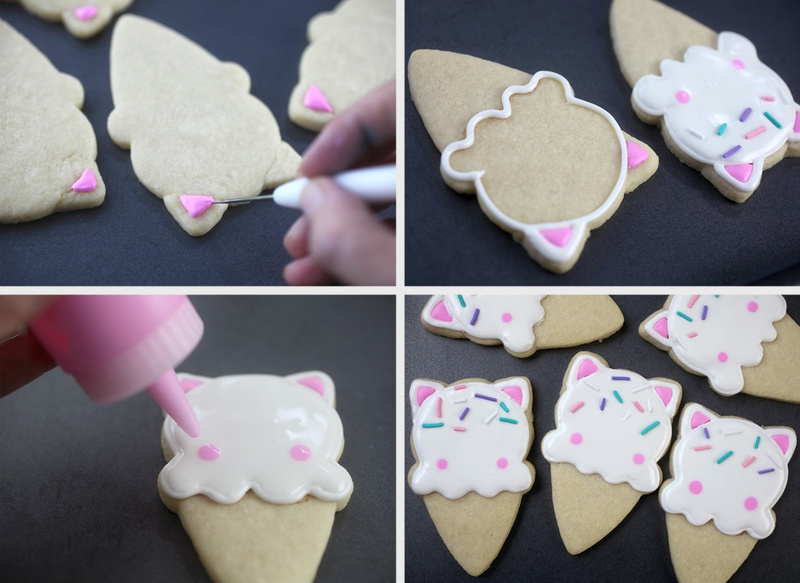 Instructions for making ice cream cookies are very detailed and beautiful. I will learn to make this cake for my children.